When you download a file normally (direct download) from a website that file is downloaded from their central server but BitTorrent is a peer-to-peer protocol. There is no central server on which files are hosted instead they are shared between computers connected to the Swarm (a group of people downloading and uploading the same file). Let's now understand the meaning of the common BitTorrent terms. A Peer is someone who is both downloading and uploading the file in the swarm. Files are downloaded in pieces, when a user downloads some pieces, he then automatically starts uploading it. A file will be downloaded faster if more people are involved in the swarm. A peer becomes a seed when he has completed 100% of the file and wish to continue uploading. 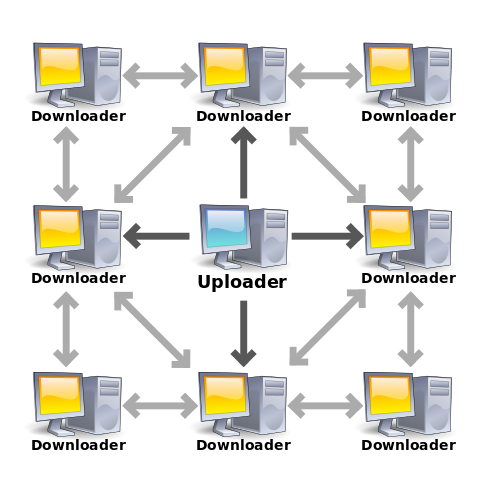 In the image above (from wikipedia) the middle computer is acting as a seed to provide a file to the other computers which act as peers. A Peer is also sometimes called a Leecher but to be specific a leacher is someone who has a very poor share ratio i.e. who only downloads the file but does not upload or limits the upload, it has a negative effect on the swarm. A Tracker is a server which keeps track of the computers downloading or already have the whole file. It introduces new computers to them so that new computer can start the download.